The North Rim of the Grand Canyon is an isolated paradise of canyons at the end of Arizona Highway 67. This beautiful highway is a path through a forest of pine and aspens. The vast sub-alpine forest of the Kaibab reaches over into the North Rim where wild flowers burst with color. The North Rim is simply spectacular, but due to the remote location nine out of ten will visit the South Rim instead. Those who vacation in Southern Utah however, are in for a treat because the North Rim is a quick jaunt away for them. The North Rim has it all, mule rides, outstanding views and trails, four wheel drive adventures to some of the best views in the entire Grand Canyon and then there is the charming and rustic Grand Canyon Lodge. The original lodge burned down but was rebuilt in 1937. This National Historic Landmark is a must see. Sitting on the back patio is a favorite of many who visit the North Rim. Set out early in the morning for the North Rim of the Grand Canyon, located 85 miles from the junction of Highway 9 & Highway 89. Le Fever view point is an enjoyable stop where you can get out and stretch your legs on the way from Fredonia to the Grand Canyon. From this spot you can see the steps of the Grand Staircase. The North Rim of the Grand Canyon is the lower step and Bryce Canyon and Cedar Breaks are the top risers. The Kaibab Visitor Center is located at the junction of Arizona Highways 89 and 67. Stop at the visitor center and see the wonderful display on the California Condor and the geological display of the layers (steps and risers) of the Grand Staircase. Continue down Highway 67 to the North Rim of the Grand Canyon, through the forested and relatively deserted lands of the Kaibab National Forest. After driving through the entrance station to the Grand Canyon, look for the road to Cape Royal. The Cape Royal Trail is an easy paved path with little elevation change. It is a great hike for everyone in the family. This is a delightful part of the Cape Royal Trail. There is a nice view of Unkar Delta and the Colorado River from this view point. After hiking the Cape Royal Trail, back track down the road the way you came in. This time stop at the Roosevelt Point View point. This is a .2 mile round trip that is an easy and relaxing walk through the woodlands. This trail is only a half-mile round-trip and is located near the Grand Canyon Visitor Center and lodge. The path is a short, flat gravel trail, weaving down to a view point of the canyon. If you have not visited Zion National Park, head to East Zion and prepare for more Southwest adventures. East Zion is the "Heart of the Parks." 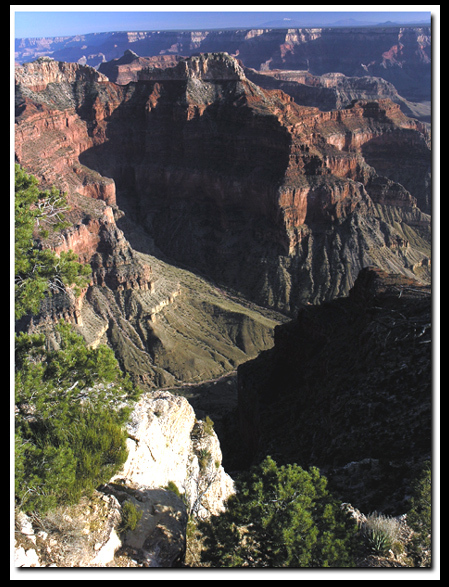 The Kaibab Plateau is the highest of the Grand Canyon plateaus. The elevation on the plateau reaches up to 9,000 ft. From this altitude the view of the Grand Canyon is impressive. This densely forested land, blossoms with life and vegetation flourishes in the cool, highlands. Engelmann and blue spruce, ponderosa pine, white fir, Douglas fir, gambel oak and quaking aspen all thrive in this primitive environment.